I was more of a dream monster kind of kid and not an under the bed one. I guess I spent enough time chasing toys and spare socks around under there I was confident that there wasn’t any room left for anything really scary. It was definitely a great place to find year old halloween candy. That’s not a monster – Biff is sleeping in a lumber mill! If you don’t check for saw blade monsters regularly the infestations can get really nasty. Of course Biff would plant himself directly in front of whirling blades…. I was under the impression that he was using the saw to “take care” of any monsters under the bed, since he appears to be pushing his bed. 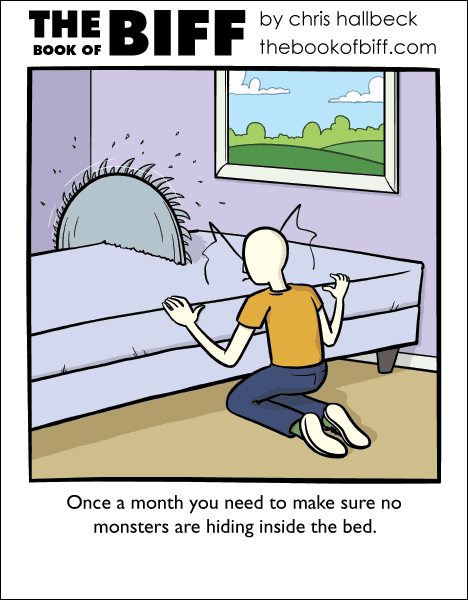 Hmmm, he’s using the sawblade to check/kill the possible monsters inside the bed. He’s sitting like he is to push the bed through the saw, in order to cut it (and the monster) completely. Either way, he must pay a ton in new mattresses. Candy that’s been under the bed for a year? Now that’s scary. I wasn’t worried about monsters under the bed; it was monsters in the closet. Every house I’ve lived in, my closet has been directly across from the foot of my bed. The fact that I just piled stuff in there rather than actually put it away meant it usually opened by itself around midnight. I had a loft bed so the only place left to imagine monsters was in the walls. I found a diary under the bed recently. I was a strange girl, fawning over geeks who still adhered to old dress codes. Now, there are ragdolls, Wikipedia printouts, fanart for various cartoons, binder sleeves for trading cards and maybe a cat on occasion.